Following the meeting of the Tourism Promotion Group headed by Antalya Governor Münir Karaloğlu at the Tel Aviv Turkish Cultural Center with members of the Israeli press, the exhibition was hold which consist of the photographs taken by Archaeologist Prof. Dr Nevzat Çevik during the excavation. The "Andriake Synagogue", the oldest Jewish Temple in Anatolia and first time introduced, has been met with great interest by the Israeli press. President of ATAV Nizamettin Şen point out that ; 1500 Year-Old Synagogue,the oldest Jewish temple in Anatolia, also reserves the epigraph that begins with the sentence Shalom al Israel. The synagogue located right next to the Granariumun, The most important ancient port of the Mediterranean,the most important section of the trade in the region also an indicator of the rich culture in the region at that time. It will contribute greatly to religious tourism. For Christians, Demre is the port where St. Nicholas lived, his church located and on the way of St. Paul's journey to spread Christianity. Şen indicates that Lycian is a city that has Rock Tombs and the ancient theater of 6,500 people capacity and added “It is very significant that we introduce this synagogue which is important for the Jews of the World. 7-arm oil lamp Menorah is a very important fragment among the ones found up to now. The exhibition continues to be exhibited at the Turkish Cultural Center in Tel Aviv. 2009 season of excavations at Myra-Andriake conducted in Demre district of Antalya province on behalf of the Ministry of Culture and Tourism, and Akdeniz University brought to light the first synagogue in the Mediterranean region of Anatolia, together with its contents. The building is located in front of the west corner of the Roman period granary, namely Horrea Hadriani, facing the harbour facilities on the north. The main room measuring 7.25x5.08 m. terminates in an apse of 3.90 m. in diameter. Another room adjoins the building on the west. Two entrances are found leading into the main room – one on the west and the other on the north. The floors of the rooms are paved with baked clay plaques while the templon area of the main room is paved with limestone plaques, which are uncovered broken and dispersed. The apsidal part of the building survives to a height of 5 to 6 m. while the rest of the walls have survived only in several courses of stones. The facts that the apse starts ca. 3 m. above the main room’s floor level and presence of traces of stairs to the east outside of the north main entrance suggest the building was two-storied with the main prayer hall placed on the upper floor. Plaques uncovered before the templon area must have fallen down from the upper floor. Small finds uncovered inside the building include two columns, two column bases, two balusters, architrave fragments with architectural decoration and soffits as well as fragments belonging to five balustrade panels, one of which is plain and four of which are decorated. A tentative reconstruction of these finds suggests that a templon or a chancel screen was formed with two columns and panels and all these crowned with a frieze of lamps with flames rising (possibly belonging to a menorah depiction), all of which collapsed downstairs. The series of lamps have the middle one with two flames while those flanking it have only one flame rising. The balustrade panels with menorah depictions were fitted with marble balusters which were topped with globes fitted on top into a mortise. The balustrade panels found fallen onto the floor of the lower story bear well-known symbols of Judaism. Fragments uncovered indicate the presence of four panels with menorah depiction in total. One panel is completed while a second one is only partially completed. The other two panels have survived only in fragmentary condition. The complete panel measures 87x44 cm and displays high quality workmanship. The menorah occupies the panel and is flanked with shofar on the right and etrog and lulab on the left. On the top moulding is an inscription in Greek in three lines. To the left of the inscription is an engraved stylized version of the menorah composition rendered in relief in the main field of the panel. The inscription cites the proper names of Makedonios, Prokles, Romanus and Roma from the family who dedicated this panel. A total of three inscriptions have been uncovered and two of them bear the names “Israel”. The inscriptions terminate with “amen” or similar religious terms. Two of the inscriptions are found on the balustrade panels with menorah depictions while the third one is found on a panel reused in the flooring of the adjoining room. This panel terminates with the phrase “erini epi ton Israil”. All three inscriptions fall to the category of common Jewish dedicatory inscriptions. Although scientific studies still continue it is possible to say that the building dates from the 4th–5th centuries CE based on the layout, masonry technique, stylistic features of architectural decoration and other finds. In Anatolia similar panels were found at Sardis, Priene, Nikaia and Side, all dating from the 4th to 6th century CE. However, the panels from Andriake stand out with their inscriptions uncovered within the context. In the late 19th century, a funerary inscription was found at Limyra and Tlos each, both in Lycia, but without any contextual connection with a building; and as they were standard funerary inscriptions they did not reveal much information about Jewish presence in the region. Similar panels found at Priene and Sardis are also dated to the 4th-6th centuries CE. The building at Andriake also has layers dating to earlier before and later than the 5th century CE. 1. The finds constitute the first architectural and iconographic evidence for Jewish presence in Lycia, thus adding a new layer to the cultural strata of Lycia. 2. The evidences in question are found both in the architecture and inscriptions and iconography of the decoration. 3. This discovery is an important one shedding light onto the place in the religious/social stratification and presence of the Jews in Anatolia during the East Roman, i.e. Byzantine period. 4. As at Ostia, this newly uncovered synagogue at Andriake is located at the harbour site, thus meant to serve the local community at the port and those visiting the port. The first well-known Jewish personage known to have visited this port settlement of Myra is St. Paul of Tarsus (Acts 27:5-6). 5. The fact that the discovery is made at Andriake, the port settlement of Myra, is not mere chance for Jewish presence, who is known to have been merchants. 6. 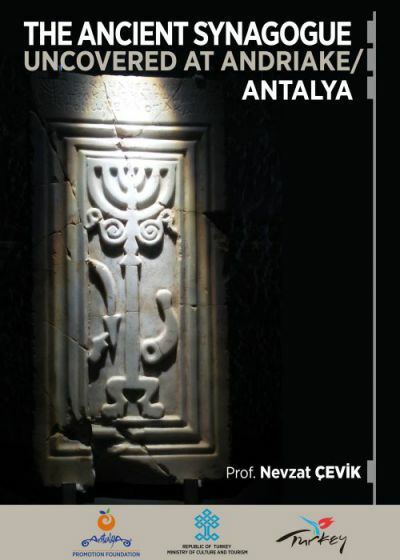 The inscriptions and decoration uncovered are of utmost importance to cast light onto the Jewish art in ancient Anatolia. 7. Following this discovery at Andriake, many excavation missions will have to revise their finds held in storehouses and architectural remains at their sites. As understood, new evidence regarding Jewish presence should be expected at Andriake/Myra and other sites in the region. Archaeological excavations of the monument and small finds have been completed. Consolidation and conservation of the building and small finds have been realized with the support of the Ministry of Culture and Tourism. Scientific studies still continue and architecture together with the small finds and inscriptions will be soon published as an article.